MEGHAN: Good morning Ags. 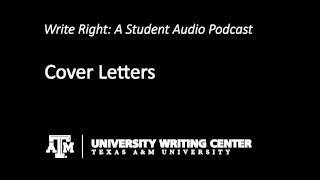 I’m your host Meghan Wall and welcome to “Write Right.” Ever wonder how to write that cover letter for a job application? Well listen up because here’s a quick tip on how to do it. CINDY: What if it says I also need a cover letter; what’s that about? MANDY: Then, in the opening paragraph state how you found out about the position, whether you are replying to a want ad, found it on a job search engine or newspaper, or word of mouth. If you know what position you are applying for specifically state that here, much like an objective. In the next paragraph show why you are a great match for the position and point out aspects of your resume that you want them to note. Draw specific parallels to why your experience and job history matches the qualifications for the job you are seeking. Another paragraph could include why you want to work for this company, what you expect to contribute, and what you expect to gain. STAN: And finally, include a strong closing, for example: “Should you need any additional information not included in my resume, please contact me by my telephone number or email address listed below. After you review my resume, I hope you will grant me an interview for this position at your first convenience. I appreciate your time and consideration, and look forward to hearing from you soon.” End with sincerely and your name. Always make sure if you type your name, also leave room for a signature too. Then include at the bottom your email and telephone number. And let the reader know the resume is enclosed.